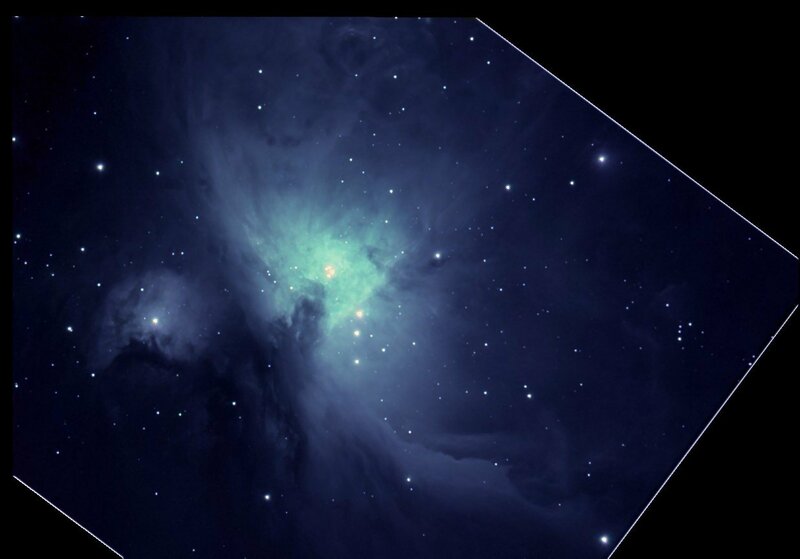 One of the most visible, beautiful and easily identifiable of the messier objects in the northern hemisphere. Situated below the belt of Orion about 1200 light years away , the Large Orion nebula is a large cloud of star forming clouds and dust . The centre 4 stars are part of the trapezium cluster where stars are currently forming. 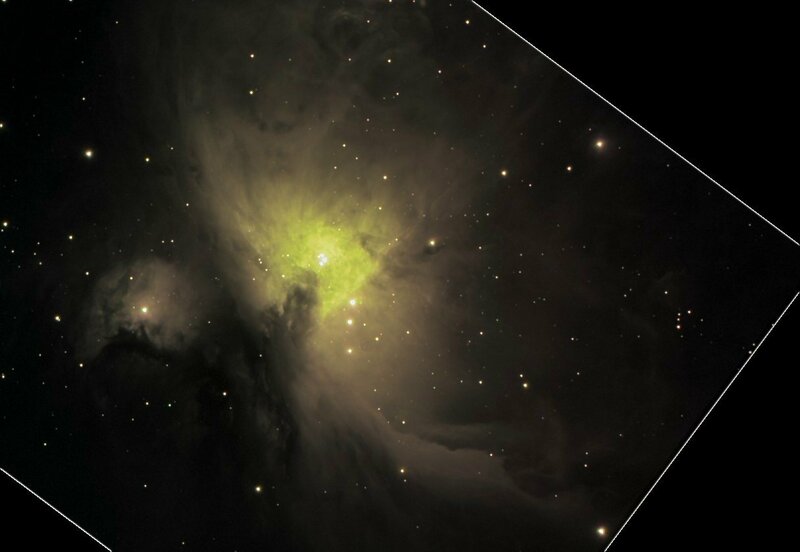 Here are two narrowband images of M42, with channels swapped around to give different colours. As this is a false palette there is no right or wrong method of mixing, but I prefer the second image. I did not use larger subframes as , even at 30 seconds, I was overexposing the trapezium. Post-processing stacked, curved layered and mixed in AA3. Mild edge preserving smooth from PSP 7 applied to final image. Filters TT IR, Astronomik Ha and Si2, Meade O3. Date 29th November 2005, 22:00 - 02:00 L channel taken on 21st Jan 2006. M42and M43 taken on 15th Jan 2002. 2 Minute unguided exposure on fuji 800 through 120mm f5 refractor in the cotswolds on vixen GP-DX mount. 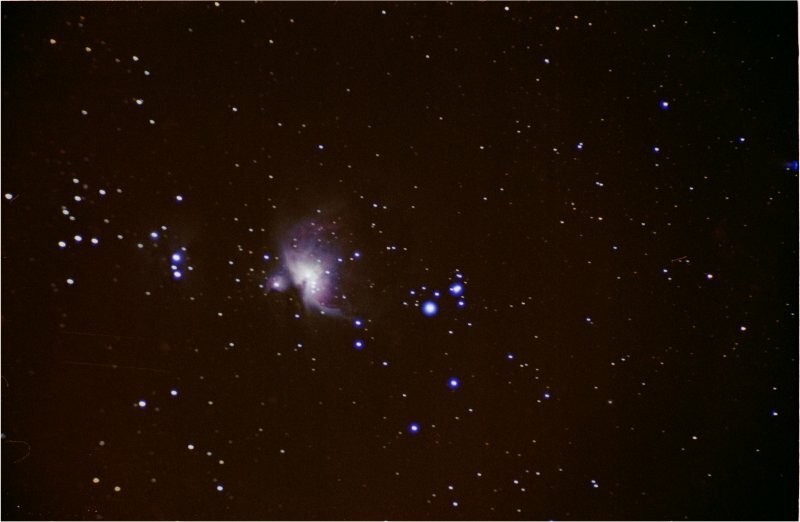 NGC1977 ( the 'Running Man' Nebula ) is visible on the left hand side of the image. Also in the image is open cluster NGC 1981 , to the left of NGC 1977. Post-processing Scanned in. No sharpening.